Scientists flew through the plumes of smoke rising from the Yorkshire moor fires to sample pollution levels. 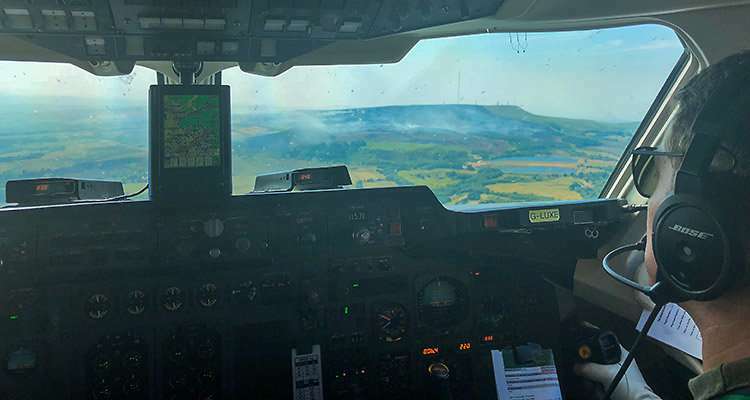 Operating the UK's specially-adapted research aircraft, a team of NERC-funded scientists have measured and sampled the air pollution released from the moorland fires at Winter Hill and Saddleworth. The recent heatwave has left the UK's peaty moorlands vulnerable to burning, contributing to global warming in the same way as burning fossil fuels. The blazes broke out on the moors in late June during hot, dry weather and have continued throughout the heatwave despite ongoing efforts from the Greater Manchester Fire & Rescue Service. 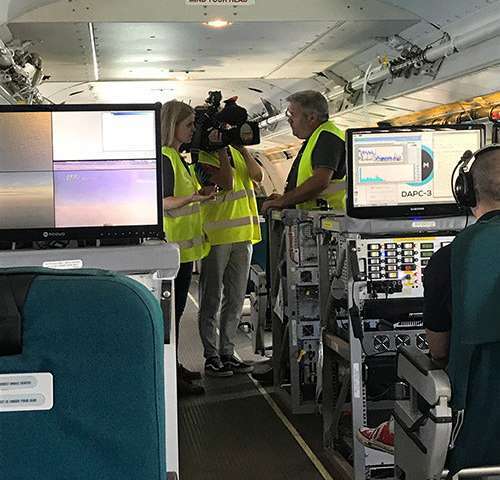 Samples from the fire plumes taken on Thursday by researchers from the National Centre for Atmospheric Science (NCAS) on board the NERC and Met Office aircraft know as Facility for Airborne Atmospheric Measurements (FAAM). The team has previously used the airborne laboratory to measure methane levels from tropical fires in Africa, but are now using the same techniques to understand the UK moorland fires. The samples are being analysed to identify gases like methane coming from the burning peat and will identify the other pollutants being released. This work is part of Project MOYA - the global methane budget, which is a major project funded by NERC. "Molecule for molecule, methane is a much more powerful greenhouse gas than carbon dioxide. The amount of methane in the air is rising fast, but scientists do not yet know why. This study of methane released from peat fires will be very helpful in identifying how much of the rise is from the burning of organic material such as peat and plants, and how much from other sources like gas leaks, coal mining, swamps and cows. More hot dry weather due to climate change is likely to lead to more moorland fires in the UK and worldwide, so it is important that we begin to understand the effects on global greenhouse gas levels and air pollution problems. The measurements taken on board the research aircraft this week will give us a much better insight into the significant air pollution caused by these fires and allow us to investigate the potential effect of future fires on the quality of the air people are breathing downwind from fires. In many parts of the world, burning forests, peatlands and agricultural waste create extensive and long-lasting air pollution events that have large impacts not only on public health, but also on transport systems and industrial productivity." NERC research centres have provided research and advice to help observe and understand the impact of the Yorkshire moor fires. 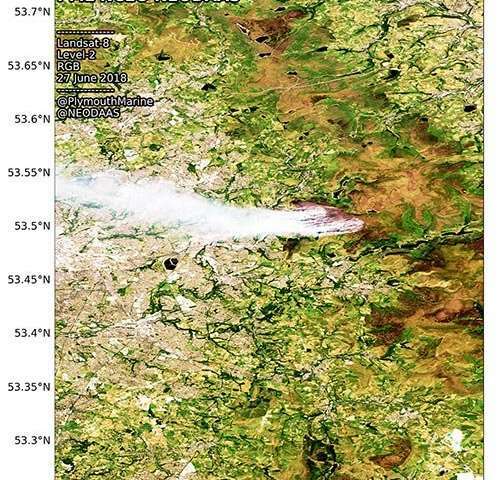 National Centre for Earth Observation scientists used satellite images to monitor the effects of the fire. The images showed the peat fires spanning seven square miles, causing destruction of local habitat for wildlife and fauna, local residents to evacuate their houses, and plumes of smoke to drift across the greater Manchester area. They have released images captured by the Sentinel 2, 3 and 3A satellites, analysed at the NERC Earth Observation Data Acquisition & Analysis Service (NEODASS) based at the Plymouth Marine Laboratory. Thanks to the recently launched Sentinel-5 P satellite, scientists have been able to observe the plume of emitted gases into the atmosphere with fine detail. At the Centre for Ecology & Hydrology (CEH), researchers were called upon for expert comment on the impact of the fires on the environment. Professor Chris Evans, biogeochemist at CEH, suggested if the peat burned down to 10cm deep across the reported burned area of 6,400 acres it could have released about half a million tonnes of carbon dioxide. "The fire will be releasing carbon dioxide as the vegetation and peat beneath it is combusted. The carbon in the peat has accumulated over thousands of years, so releasing this to the atmosphere will contribute to global warming in the same way as burning fossil fuels. Again, during the 2015 fires Indonesia was emitting more CO2 to the atmosphere than the whole United States, so globally these fires are a really important source of greenhouse gas emissions. The moorlands around Manchester have been soaking up atmospheric pollution since the start of the industrial revolution, so there is a risk that the fires could release some of this pollution back into the air or water. The ecological damage resulting from major fires can be severe. The loss of vegetation cover and damage to soils can trigger erosion, the timing for ground-nesting birds is terrible, and the recovery of moorland plants is likely to be slow, particularly for the wetland species that are critical to the ecology of peatlands. The vegetation on the moors around Manchester is still recovering from over a century of industrial air pollution, and huge efforts have been made in recent years to re-wet and restore these ecosystems, so fires like this represent a major setback to those efforts."